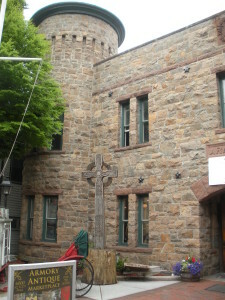 The Newport Armory was constructed 1885 by the Rhode Island Militia. The Armory consists of two distinct sections. The first section is a two story Head House located on Thames Street with cylindrical towers at each corner. The second section is a timber and steel framed two story drill hall. The Head House consists of masonry walls with a granite fascia and timber framed floor and roof systems. NE&C was retained by the City of Newport to provide Building Assessment and Structural Engineering services as well as Construction Phase Engineering. NE&C preformed a visual inspection of the building to determine the condition of the structural system.